George Graham reviews The Unknown New's "Thieves"
Jazz-rock fusion has taken a number of forms over the decades. It started in the 1970s with some jazz musicians going electric, often very electric with screaming guitars and whooping synthesizers. Other early artists took it in a funk direction, and there were times in the 1970s when some fusion came dangerously close to disco. In the early 1980s, Pat Metheny set a new course with more sophisticated compositions and arrangements, with more acoustic textures. More recently, one is hearing some of the edginess of the alternative scene with groups like the Bad Plus and Throttle Elevator Music. This week we have another emerging fusion band who draw the line between rock and jazz in interesting, sometimes overlapping places. 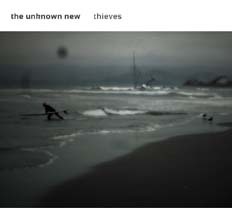 The group is called The Unknown New, and their new second album is called Thieves. The Unknown New is led by Chicago composer and multi-instrumentalist Paul Mutzabaugh. From its instrumentation, three guitars, bass and drums, one would expect a rocky, jam-band sound, but the Unknown New hews closely to the compositions by Mutzabaugh with the usual room for some improvising. Thus the group is primarily a vehicle for the interesting, multifaceted original pieces, which are often dark and brooding in texture. Though Mutzabaugh’s on-line resume lists him first as a keyboard player, there are no keyboards on the new album, though there is some guitar synthesizer. Mutzabaugh plays mainly bass on the album. The guitarists are Jim Tashjian, who plays acoustic guitar, Mike Pinto on electric guitars, and Chris Siebold, who served as house guitarist on A Prairie Companion, plays electric and some steel guitar with the Unknown New, often adding to the spacey ambiance. There are two percussionists, Jon Deitemyer on drum set, and Rich Stitzel on assorted percussion. There is also a six member string section who appear on three of the pieces. The compositions on Thieves are said to be darker in texture than the group's first album Sunken Garden. But the material on the new recording ranges from brooding to upbeat, and there is one track that can resemble a more conventional funky fusion piece. The group sometimes brings a cinematic quality to the music as it crosses stylistic boundaries, often within a single track. Thieves, the new second album by the Chicago-based instrumental ensemble The Unknown New is an interesting and appealing collection of compositions by the group’s leader and bass player Paul Mutzabaugh. The three-guitar lineup turns out to be less rock-oriented than one would expect. Instead, the group serves up laid-back, textured music that sometimes can move a bit slowly but is full of subtle musical ideas that can come out on successive listenings. The musicians all have the chops to play this kind of music with requisite degree of class, while the arrangements take turns that further remind one of the high quality of the writing. Our score for sound quality is a rare grade “A.” The album has a nice combination of atmospheric ambiance with admirable clarity. And, something that is rare these days, the recording was not mastered and compressed for maximum volume. Instead, there is a decent dynamic range which enhances the music even more. Though good jazz-rock fusion is nowhere as commercially viable as it once was, it’s good to see that artists like Paul Mutzabaugh and his group The Unknown New are still bringing creative energy to the genre and making music that defies ready categorization.